When it comes to home security, a high-tech sensors-and-cameras system can go a long way toward keeping your home secure. However, even the best home security systems are no good if you don’t have quality locks. A few basic deadbolt locks may not seem like much in comparison to video cameras and sensors on all your doors and windows but, without that extra level of protection, it’s easy enough for a burglar to force their way into your home and be off with your valuables before the police even have the time to respond. This is why it’s important to have properly installed, well-functioning locks, no matter how high-tech your security system is. Whether you just built a brand new home or you bought a house that was built more than a century ago, one of the first steps you should always take is to re-key your home. We don’t say this just because we’re locksmiths looking for business. As we mentioned above, good locks are one of the biggest factors that stand between your home and a burglary. The downside, fortunately and unfortunately, is that the standard key is very easy to duplicate. When you have a key that breaks, it’s great to be able to call up your local locksmith and have them whip up a new key. However, as easy as it is for you as the homeowner to get a key duplicated, if anyone had a copy of the keys to your home before you—whether it was the previous owners or a contractor who was part of the building process—they could have those keys copied just as easily. If your locks use a standard notched key, copying that key is a pretty simple matter. Most locksmiths have a duplicating machine that uses a key and a key blank. The machine has a cutting wheel and a guide; as you can probably imagine, the guide follows the notches and grooves of your existing key and tells the cutting wheel where to cut. 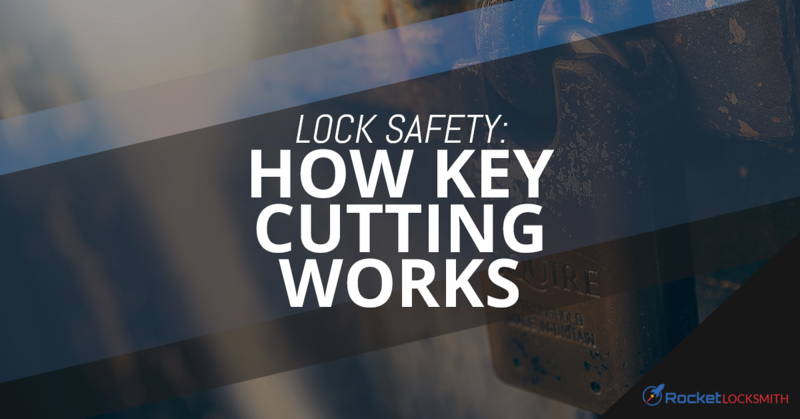 A trained, licensed locksmith will take the time to ensure the key you’re asking them to copy is yours and you have the right to do so, but some key cutting places aren’t as scrupulous. Because it’s so easy to copy a key, we recommend always getting your locks re-keyed. This process changes the pins in your locks without changing the hardware, making sure any old keys will no longer work in your locks. The other big means of ensuring your locks are offering the safety and security they promise is to ensure every lock is installed correctly. For deadbolts on exterior doors, this means ensuring that the lock itself is firmly installed in the door and has no wobble at all. More importantly, it also means ensuring that the metal plate on your door frame is installed with screws that are a minimum of three inches long. Any shorter, and that metal plate won’t be attached to the door frame sturdily enough and the wood of the frame will give way under force, allowing a burglar in. For key cutting and other locksmith services in St. Louis, contact Rocket Locksmith today!